This is the Home page of the RBR website for the Healthcare Professional. It has been designed to make the RBR come alive. The News section includes current developments in the RBR, website, or related initiatives. Evidence summary: Summary of current evidence on this item as outlined in RBR Resource Pages 1 – 4. This includes the summary of current evidence found on RBR Resources Pages 1 to 4. One can link to guidelines, parent resources, and the literature reviewed organized by topic. Literature review: Current literature scan critically appraised and annotated for methods and outcomes with levels of evidence and strength of recommendation for this item. RBR Parent information sheets for ages: 1 – 2 wks, 1 mo, 2 mo, 4 mo, 6 mo, 12 mo, 18 mo, 2 – 3 yrs, 4 – 5 yrs. Links to reliable resources organized by age and by topic, including a search function. The updates/changes in the most recent edition of the RBR are itemized. One can also view and download a version of the RBR with the changes shown in teal print. Current literature has been scanned and critically appraised and annotated for levels of evidence using the former classification of the Canadian Task Force on Preventive Health Care and the GRADE system where possible. Strength of recommendation for the RBR items is: Good, Fair, or Inconclusive/Consensus. The font of each item in the RBR Guides reflects its strength of recommendation. Publications on or about the RBR are listed. These include a validation study showing that well-baby visit documentation by family physicians using the RBR was comprehensive for all studied variables including not only physical examination and measurement of growth, but also was statistically more likely (p<0.05) to include type of feeding, discussion of safety issues, assessment of development, and overall comprehensiveness. 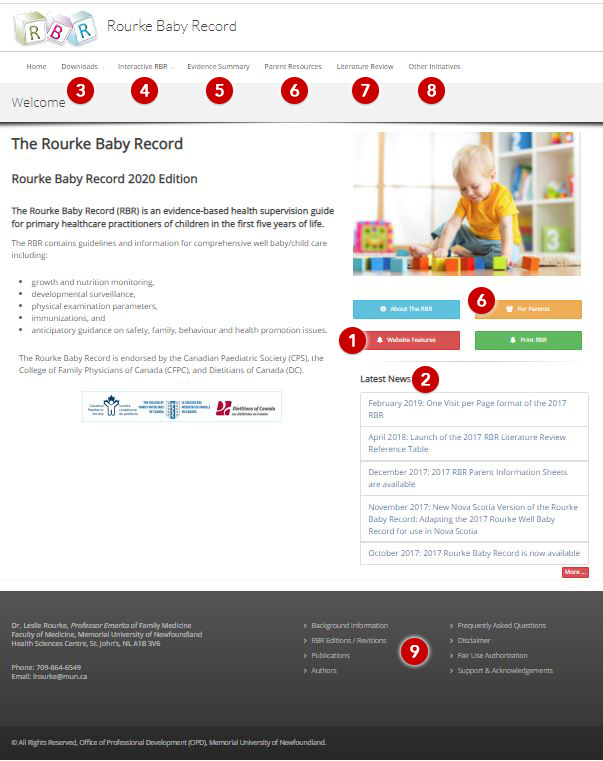 Links to other initiatives are highlighted, such as official modifications of the RBR for unique populations, and other initiatives for care of infants and children. Information on the background of the RBR and its authors, support and acknowledgements, frequently asked questions, disclaimer, and fair use authorization.